Fidesz has been the dominant party in Hungary in recent years and secured a ‘supermajority’ of two-thirds of MPs in the Hungarian parliamentary elections in 2014. However, as Andrea L. P. Pirro writes, the party’s position has come under threat of late, with a by-election loss earlier in the year removing the supermajority, while another by-election on 12 April was won by a representative from the far-right Jobbik party. He argues that while the era of Fidesz dominance is far from over, the rise of Jobbik poses a challenge for the country’s Prime Minister, Viktor Orbán. The victory of the far-right Jobbik (Movement for a Better Hungary) in a by-election in the Tapolca-Ajka-Sümeg district on 12 April left observers of Hungarian politics simultaneously shocked and unsurprised. The Tapolca by-election garnered considerable attention due to the (now-old and over-abused narrative of the) ‘rise and rise’ of the far right in Europe in general, and Hungary in particular. There were high stakes with the elections in this district of western Hungary, and Hungarian parties and public opinion seemed very much aware of that. The dominant force in Hungarian politics in recent years has been the national conservative Fidesz, led by the country’s Prime Minister, Viktor Orbán. In the latest parliamentary elections in April 2014, Fidesz, alongside the Christian Democratic People’s Party (KDNP) that it formally sits in coalition with, won its second consecutive term in government with 45 per cent of the votes – enough to grant Orbán and his allies a two-thirds ‘supermajority’ in the National Assembly. Unity, a short-lived coalition of the left, scored 25.7 per cent of votes, while Jobbik reported its best result to date with just over 20 per cent. In essence, the by-election was a test for the ruling Fidesz-KDNP coalition (which had recently lost its two-thirds majority in Parliament following another by-election in the Veszprém district), but also for the far right’s popularity and the future of the parties on the left. Jobbik: the chink in Fidesz’s armour? The by-election took place following the death of the Fidesz MP Jenő Lasztovicza in January this year. From the outset, the competition appeared limited to two candidates, Zoltán Fenyvesi (Fidesz) and Lajos Rig (Jobbik). Jobbik stood a chance as the mayor of Tapolca is a member of the party and Rig won a seat in Tapolca’s municipal council in October 2014. Apart from this apparent advantage, Jobbik has also started to pose a threat to Fidesz in its own territory. Therefore, the victory of Rig (35.5 per cent) against Fenyvesi (34.4 per cent) by a provisional margin of 261 votes (a small number of ballots still have to be counted) suggests that the far-right has managed to extend its sphere of influence while attracting and mobilising new voters. Figure 1 shows the full results and how they differ from the 2014 parliamentary elections. Still, what bolstered Jobbik’s chances was a combination of internal and external factors. In line with a strategy of ‘detoxification’, the far right party has toned down much of its uncompromising rhetoric in the last couple of years. Jobbik accordingly adopted a much friendlier guise and made skilful use of the media to deliver hopeful and captivating slogans (notably ‘the future can’t be stopped’). This has struck a chord among the moderate electorate that had once deemed the party too radical; at the same time, it has reinforced Jobbik’s support among the young and the party is now firmly placed as the most popular among those aged below 30. Nevertheless, the party has not changed its brand, but simply repackaged it – as made clear by one of the party leaders, Márton Gyöngyösi when commenting on the election. The party has successfully managed to reinvent itself many times, while still remaining true to itself. This strategy has held for the radical Christian and anti-globalist stances it adopted in the early period of the party’s development; the anti-Roma and fierce anti-establishment rhetoric that initially raised the party’s profile; and a renewed anti-EU discourse. But, more crucially, it is also true in relation to the social breadth of its economic platform, which it has intelligently sought to emphasise of late. In fact, none of these themes has disappeared from Jobbik’s platform – only the degree to which different elements are emphasised has changed. The party, which has until recently spoken only to a (radical) portion of voters, has strenuously sought to present itself as a credible governing alternative, and is now successfully expanding its pool of voters to disaffected Fidesz supporters. Simply put, the party’s leader, Gábor Vona, now wants to present Jobbik as a ‘people’s party’ and the Tapolca by-election has brought home the first results of this strategy. While Jobbik’s strategy explains some of its success, there is only so much that the party can do to master its own fortunes; the rest evidently depends on the political context within Hungary – and, in particular, on the actions of Fidesz. Ultimately, Fidesz has directly/indirectly contributed to the consolidation and rise of Jobbik. First, Orbán has made some critical missteps during the last year in government. Examples include his attempt to introduce an internet tax (promptly cancelled after mass protests), which gave a first blow to the popularity of the Hungarian government, as shown in Figure 2. They also include allegations of corruption and a sequence of brokerage scandals, from which none of the established parties ever seems to be immune. The Sunday closing of retail stores was also met with a lukewarm reception (to say the least) from the majority of Hungarians. Second, while in government, Fidesz has flirted with Jobbik’s ‘nativism’ and systematically co-opted part of its policy agenda. By doing so, Fidesz has mainstreamed Jobbik and paved the way for its success. At the same time, Orbán has also moved further away from the centre of the political spectrum. In addition, through its cosmetic moderation, the far right has outflanked Fidesz. Now that the two parties come across as two faces of the same coin (nativist politics), Jobbik has the comparative advantage of representing the untainted and anti-establishment side of it. While Jobbik’s initial fortunes have been carefully and independently crafted, the party’s recent success is a function of Fidesz’s political miscalculations. The strategy of demonising the far right, while co-opting its policies, has clearly backfired. Fidesz is simultaneously losing consensus due to unpopular decisions and the merit of Jobbik rests in having patiently waited to take advantage. Whether Jobbik will be able to sustain this performance until the 2018 elections is unclear, but having broken the ‘glass ceiling’ its success or failure may no longer depend on Fidesz’s counter-strategies. 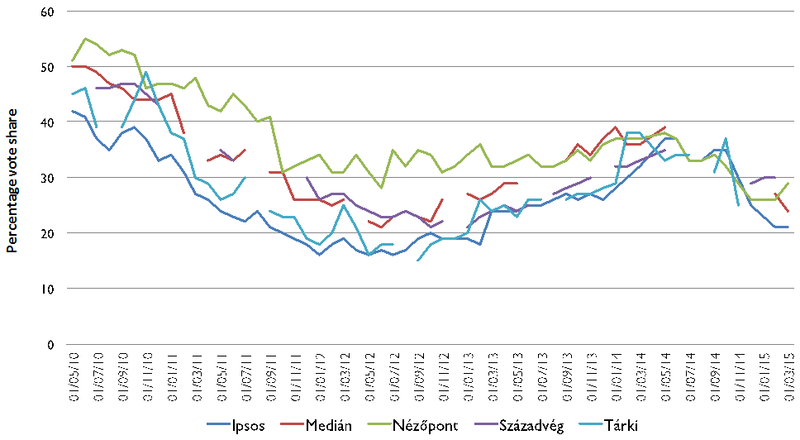 Be that as it may, these are not Fidesz-KDNP’s last days; in fact, the coalition still has ample room for manoeuvre. What is clearer now is that Orbán may find it difficult to dismantle the liberal democratic makeup of the country and follow an all-out illiberal trajectory without a supermajority in Parliament – unless, of course, such a trajectory is supported by Jobbik MPs. Andrea L. P. Pirro holds a PhD in Comparative and European Politics from the University of Siena. He is joint convenor of the European Consortium for Political Research (ECPR) Standing Group on Extremism & Democracy. His research interests include populist and radical politics, Euroscepticism, social and political change in Europe, parties and elections. His book The Populist Radical Right in Central and Eastern Europe: Ideology, Impact, and Electoral Performance is forthcoming from Routledge.